It’s been a few weeks since I posted a new recipe on the blog now. Summer vacation is over, and I have started to bake again :) After recipes with loads of fruits and berries throughout the summer, I think it is time for an autumn inspired recipe. Summer isn’t over yet, but I hope you can tolerate some autumn spices now. 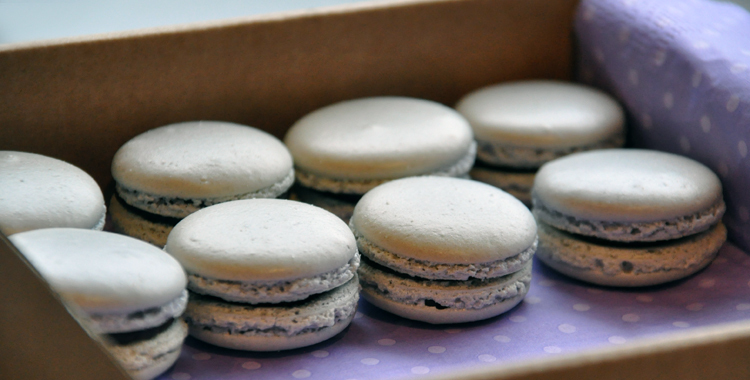 These macarons have a rich taste of spiced tea, which blends well with the dark chocolate. Use a chai tea, Earl Grey, or another type of spiced tea. Put the cream in a saucepan and bring it to a boil. Remove the pan from the heat, and add the tea. Let the tea steep in the cream for about 10 minutes. Strain the mixture through a tea strainer, and measure it again. The tea absorbs a bit of the cream, so make sure you have 1/2 dl (1/4 cup) left of tea infused cream. This is the amount you are going to continue on with in the recipe. Combine the chocolate and the tea infused cream in a small pan. Heat the mixture on low heat until the chocolate has melted. Remove the pan from the heat and add the butter. Mix together and leave to cool.